Never covered by Bob Dylan, this song is, however, obviously related in theme and lyrics (albeit only distantly in tune) to Dylan's "Man On The Street." The Almanac Singers' "The Strange Death of John Doe" (by the late Millard Lampell), recorded (Pete Seeger, solo), New York, NY, mid-March 1941 as Almanac 1101-A, reissued on an excellent Bear Family Records box-set ("Songs for Political Action"). "an original based on an episode on West Fourth Street in the Village. Bob had seen a policeman jab a dead man with his club to stir him." "A possible source for the song's striking image, and indeed for the song's verse structure, might be found in Bertolt Brecht's poem "Litany Of Breath." Now, is John Bauldie's conclusion still valid (in light of "The Strange Death..." and the even older "Beggar Joe")? Does anyone know the original German title of the Brecht poem cited? 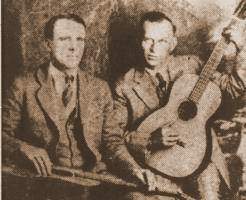 The song in question was recorded by Tom Darby, vocal & guitar, and Jimmie Tarlton, vocal & steel guitar, as Columbia Master #148 305-2, in Atlanta, GA, on Apr 15, 1929. This sentimental ballad harks back to an earlier era. It was published in songsters at least as early as 1877. Its authorship is confused in that Fred J. Mackley claimed it around 1877, but Walter Phoenix claimed both words and music in 1880. Folklorists began to cite this ballad in 1925. It is interesting that there were a number of hillbilly recordings, but all of them were before 1930. Just why it did not continue its popularity among hillbilly artists is not clear. Ed Kahn, liner notes for Bear Family Records set "Darby & Tarlton -- Complete Recordings", p. 27. Dead in the cold street was poor Beggar Joe.